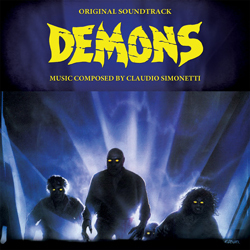 If you’ve seen Lamberto Bava’s Demons (1985), released on Blu-ray in North America by Synapse Films and in the U.K. by Arrow Films, it is impossible not to hear Claudio Simonetti’s main theme in one’s head. It’s probably the catchiest theme written by the composer in his long career scoring horror films for a variety of directors as a solo artist and with the band he co-founded, legendary Italian prog-rock group Goblin. Demons was co-written / produced by Dario Argento, and features a grisly combination of gory special effects and source songs to keep the drama moving as innocent moviegoers are transformed into flesh-tearing zombie-demons inside an old cinema. To celebrate the film’s 30th anniversary, Rustblade Records have released Simonetti’s score as expanded and remastered LP and CD editions, plus a bonus CD with remixes of the film’s main themes by other artists. My review of the new CD will appear in an upcoming issue of Rue Morgue magazine, but my half-hour interview with Simonetti is available on iTunes, Libsyn, and YouTube. I’ve also added a brief Q&A with Rustblade’s owner, Stefano Rossello, who shares his thoughts on releasing soundtracks on vinyl – a topic that also comes up frequently in my conversation with Simonetti. In addition to the creation of Demons, Simonetti also discusses the new remixes, the great sound engineering typical of Italian soundtracks of the 70s and 80s, an upcoming recording of Goblin’s Profondo Rosso / Deep Red score by his new band Claudio Simonetti’s Goblin set for release later this year by Rustblade, and the possibility of releasing Simonetti’s music for the classic 1922 silent film Nosferatu – something I’ve been keen to see realized for several years. Speaking to Simonetti was a personal & professional high – I had the pleasure of seeing Goblin perform at the Opera House in 2013, and detailed the experience in a blog + some related reviews in a prior post. Goblin & Argento fans in Toronto should also note there’s a 35mm screening of Deep Red at the Royal Cinema via the Black Museum on Wed. June 10th at 9pm. Also showing at the Royal: the cult film Roar (1981), which screens Sat. May 23 and Wed. June 3 at 9pm. Never heard of it? Well, Drafthouse Films will be releasing it on Blu-ray and DVD sometime in November, but this odd little film is touring select cities after vanishing from distribution for years. The short history: Roar was produced and directed by Noel Marshall, the agent who handled the sale of William Peter Blatty’s The Exorcist novel. Costing over $4 million, the indie film also starred Tippi Hedren and Melanie Griffith and was shot by Jan de Bont (Die Hard) in Hedren and Marshall’s private big cat preserve, Shambala. Coming next: reviews of Yasuharu Hasebe’s Black Tight Killers (1966) and Massacre Gun (1967), the latter new on Blu from Arrow Films.